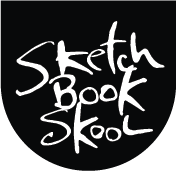 For the last few months, I have been engaged behind-the-scenes in new and exciting things at Sketchbook Skool. Koosje and I have been joined by several fantastic new staff members and together we are rebooting the ol’ Skool for 2016. If you like the sort of things I write here, you’ll like what we are planning to do at SBS. It’s not a run-of-the-mill art school, nor is it like the many platforms that seem to be popping up to offer online courses. Sketchbook Skool is first and foremost a creative community of over 10,000 people around the world who meet to encourage and inspire each other. Our plans for the new year revolve around building and engaging this community. That means new kourses but also things like webinars, ebooks, drawing projects, visiting artists, real-world get-togethers, and many more free forms of inspiration. We are reinvigorating Q&Art, our YouTube chat show. We also hired an amazing new editor for our blog, a former senior editor at Oprah and author of a dozen books. And we have a new COO and marketing guru who is streamlining our operations and making things run so, so much more smoothly. Our reorganization means I have more time to do fun things like write blogposts and books, give talks, and make videos. Like this one — to announce our new year, conceived shot and cut in two days in NYC and Amsterdam. I hope you enjoy it and will join me at SBS in a few weeks. Next Post Thank you, Internet. The best email EVER!!!! All star cast! Oscar buzz! Yipeeee. AndHappy New Year!! This video drama is so fun! You guys are hilarious. AWESOME video. So excited about your plans and additions for 2016. Sending tons of gratitude to you and the team! Tommy absolutely cracks me up! Bravo! And Tiny Tim has earned many scratches behind the ears! Looking forward to the Yew Year & SBS. this IS hilarious! thanks for the entertaining video! You guys are so funny! Merry Christmas! Can’t wait for 2016!!!! Lol, too funny and very klever. Looking forward to 2016! hee hee hee! loads of fun happening! Did you use peanut butter stuck on the roof of the dog’s mouth, to get the dog to talk to us? Cute! Ok, Count me in! January 1st! Just put it in my new 2016 planner! Thanks for the best Christmas present ever! Hugs to all! Happy Holidays to all whatever you celebrate! Yippie! A whole new school, new klasses, teachers, editors, even Ophra and Buzz Bain? I heard Tommy Kane got banned from the MET! Look at him now!! Oy Vey! I need to do my recruiting… On Facebook and on my blog, call my friends, email others! Those klass rooms will be filled to capacity in no time at all! 20,000 students in 2016! Feel the Kern…ival! Bye, I’ve got to fill my water brushes, sharpen my crayons! Buy more art supplies??? Naaah, I have enough, maybe a new lunch box! Or a UHaul to carry them all in! See you in January! I can hardly wait! It was all Tommy Kane could do to keep from laughing…,I think you were all having a great time. Good job! I’ll be there…. So happy that SBS is starting up again in the New Year – I’ve really missed everything and everybody, and I can’t wait to get re-inspired and stimulated by all of you. Good news! If you stop drawing it makes your teeth go bad? And you develop bad taste in jewelry? I better not risk it. I could have played the part of Scrooge and this has made me realise I need to start drawing again!